The ancient world of the Roman Republic was a tumultuous and dangerous place. In Senator, Rome will be faced with a myriad of challenges, such as economic turmoil, revolt, plague, and the wars against Romeâ€™s many enemies. 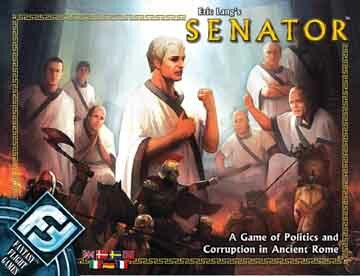 As senators of Rome, players must work together to resolve the dangers facing the Republic while plotting their own devious agendas. If you've got this game or if you're considering picking it up, check out the Debate Card Variant I posted at the Boardgame Geek. You'll find it easily in the Files section on the page at the link below.